A music video is something I really enjoy making, so much so that I should probably be doing it more. It’s an interesting form of film making, your soundtrack is there before you even start to figure out what the images are even going to be. It’s also a medium that’s incredibly easy to underestimate, in fact, I underestimate it every time. Music moves and it tends to keep moving. It can be quite difficult to keep up with. You may have a shot for that line, or that verse, but the amount of times you find yourself forgetting a small one second fill or suddenly realising how long that guitar solo is in terms of frames of video. It always trips me up and it always brings out the most creative edits in me. I should probably point out that it’s more of a personal taste thing for me, the kind of videos I’ve made and the songs I’ve cut to rarely leave an opportunity for long lingering shots. But I feel that the pace of the visuals need to keep up with the music, especially when your audience is the easily distracted you tube viewer. For my first music video in the role of director, I also found myself working within an even tougher genre – comedy. The Rubberbandits were in Edinburgh for their daily fringe show and they wanted to shoot a video for one of their upcoming songs. A catchy track about not being able to tell the difference between hipsters and hobos. The video would go on their youtube channel and would get used in their live shows. I was sent a rough mix of the song, the lyrics and I met up with Blindboy Boatclub and Mr Chrome and we talked ideas. They had a pretty clear idea of what they were looking for, for a comedy song like this, the action really had to match the lyrics. Having lived for years in Edinburgh, I was able to suggest locations that would best suit each shot which allowed me to visualize the gags before shooting. Armed with a shot list, my trusty Panasonic AF101 and a small car. The bandits, myself and an onscreen hobo named Bono started at 10am on a cold Thursday August morning. I’m not going to lie, the amount of locations and shots we wanted to capture was a little ambitious, but with a quick point and shoot attitude we started ripping through what we needed to get (while taking time to get it right of course!). We started in the Meadows in Edinburgh, along to Forrest Road, across to George Street, down to Leith and then back to the Meadows again. It was a mad day of very satisfying guerilla filmmaking. What made it even more interesting is every so often we’d find a spot, or see something and one of the guys would think of a gag and we’d drop and shoot it. 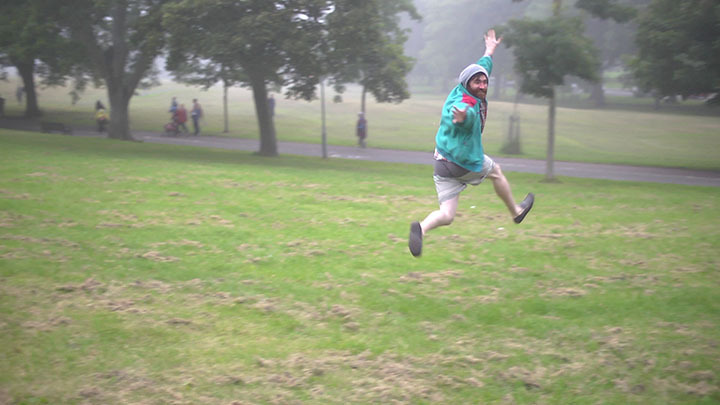 The shot where our hobo/hipster drops in front of a football game and starts doing yoga. That was about 5 minutes from “let’s do that” to “right, we’ve got that, let’s go”. The sequence with the emotional bricks at the end was the same, a “what about…?” moment on location that turned into something great. Originally I had thought the video was going to be mostly performance with short gags sprinkled through out, but thanks to how we shot it, the video is absolutely packed with jokes. When it came to the edit, I had so much to work with it just came together. Those fills and unexpected gaps always had something and nearly everything that was shot was used. A decision was made on the day to make the video black and white. One, to lend it a little artistic credibility and two, we had shot it on and incredibly foggy day, so the colours were a wee bit washed out. But we couldn’t have asked for a better combination, it really brought something to the vid. 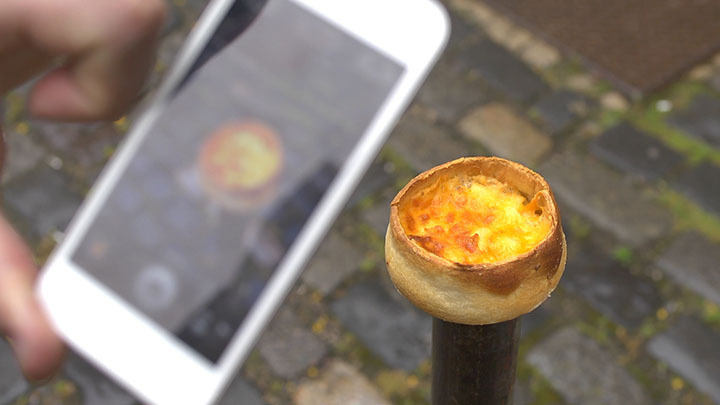 One interesting fact about the video, the shot of the instagrammed bin pizza had originally been a Macaroni pie, a pastry so Scottish that we had to change it in case nobody knew what they were looking at. So that’s my hand, my phone and…well I threw away the pizza. Once finished I added a wee bit of film grain to the final product just to add to the look. Once delivered it was quite well received. 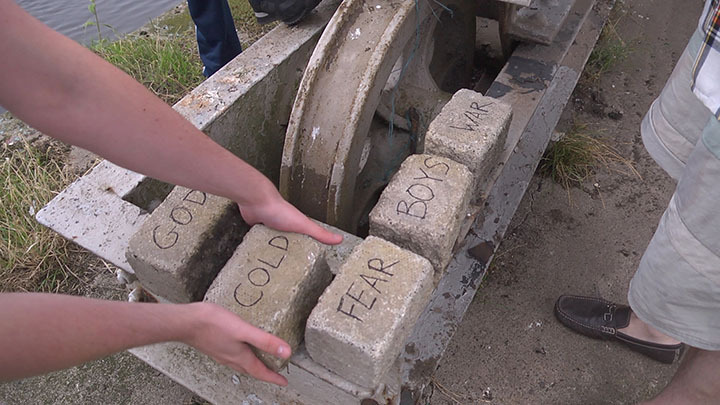 It even managed to get itself a slot on Republic of Telly on RTÉ2. As well as working with some amazingly talented people, the experience of making the video this way was quite creatively charged and set me up for a few music video productions to come. You can watch the Hey Mister video, right here.